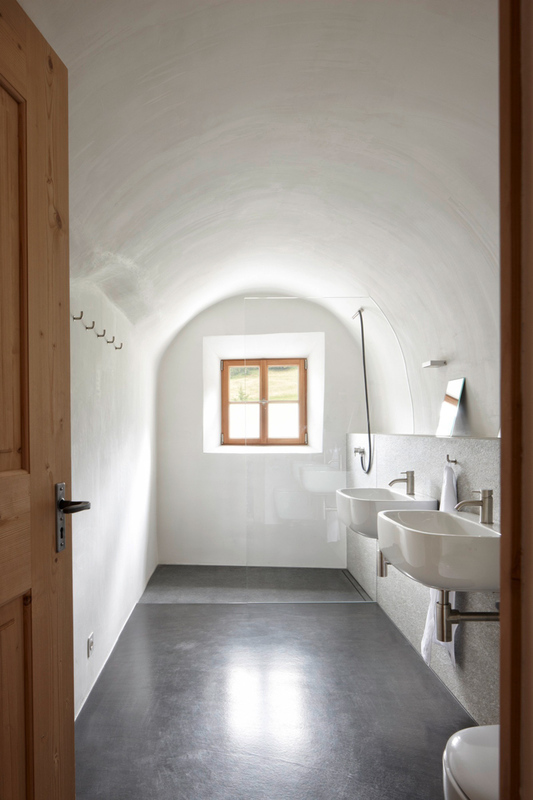 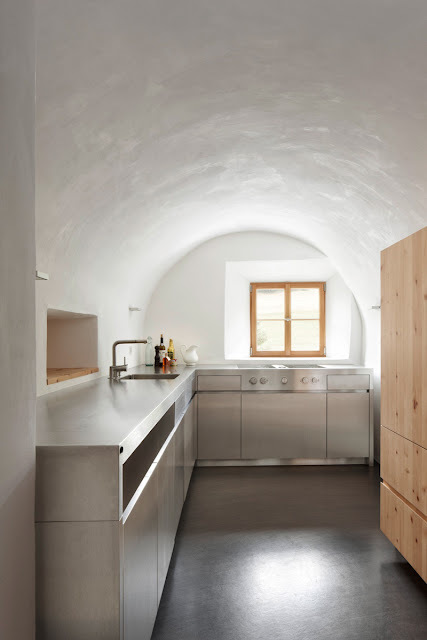 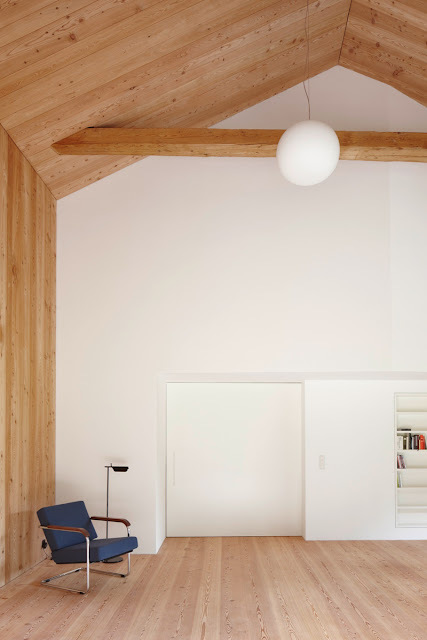 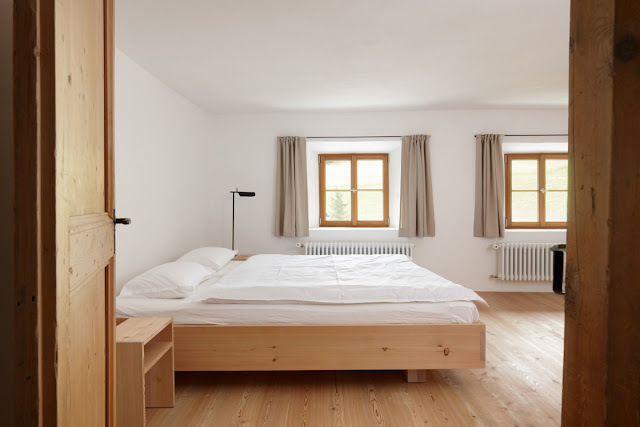 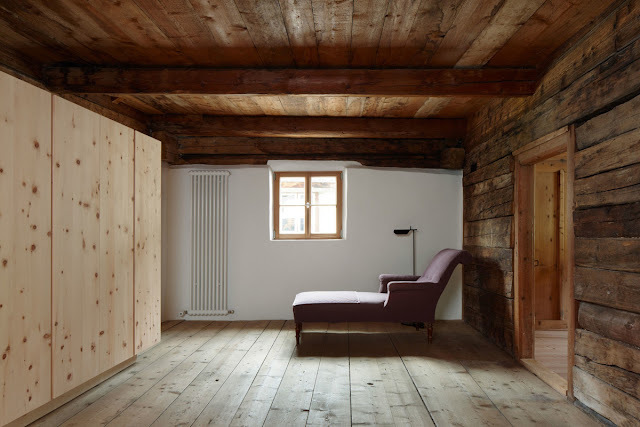 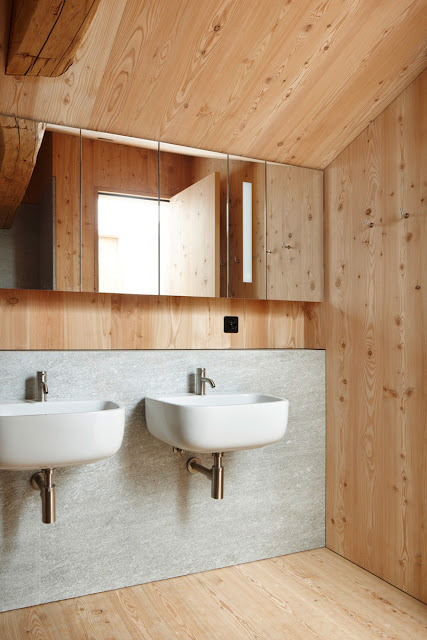 Philipp Baumhauer Architects renovated a traditional farmhouse in Switzerland through a minimalist approach that respects its original character. 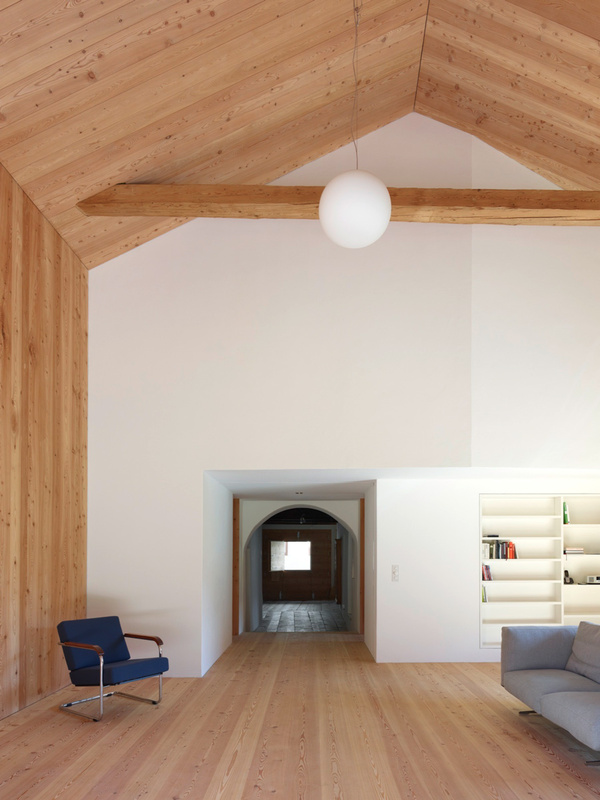 A new living space was inserted within the existing stone walls as a structurally independent wood structure that also extends itself on the exterior facade. 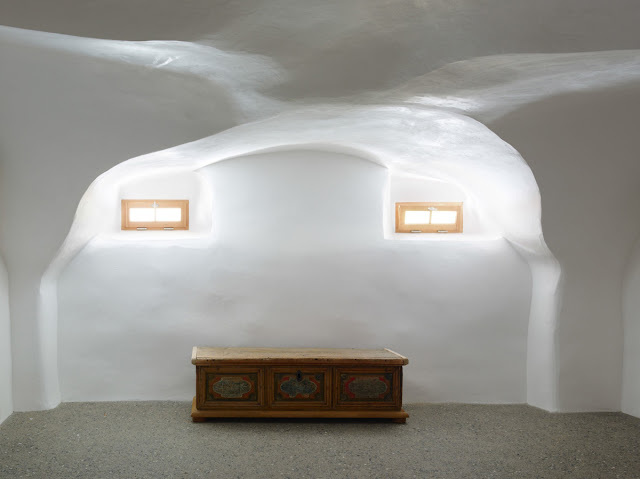 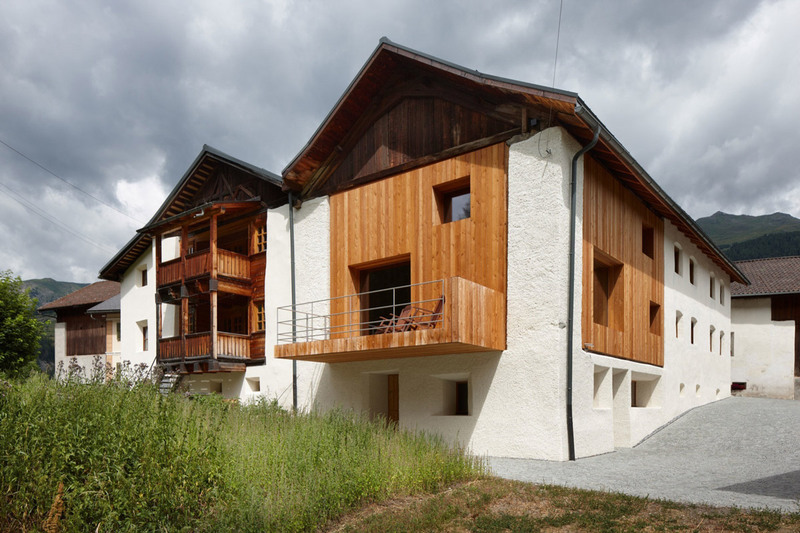 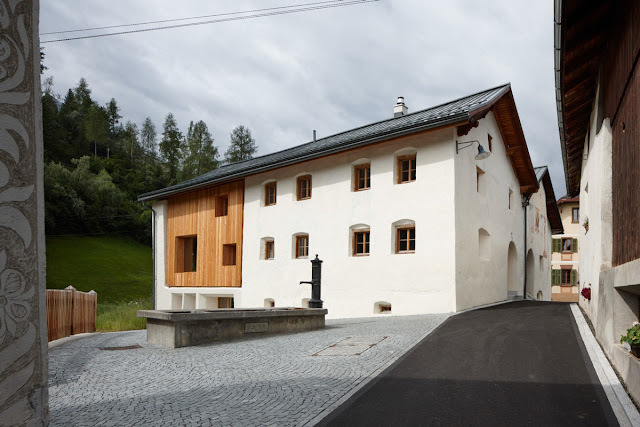 "This classic Engadine farmhouse in the Swiss hamlet of Florins was renovated and converted by Philipp Baumhauer Architekten with respect for the existing. It consisted of a residential section facing the village center and an agricultural section away from the road. 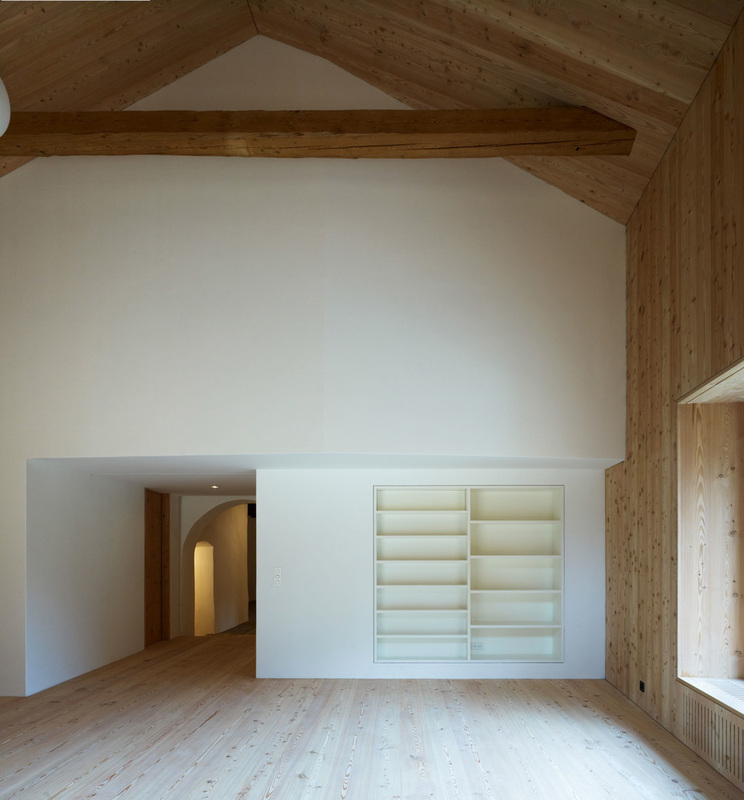 The building was completely refurbished and additional living space was added. 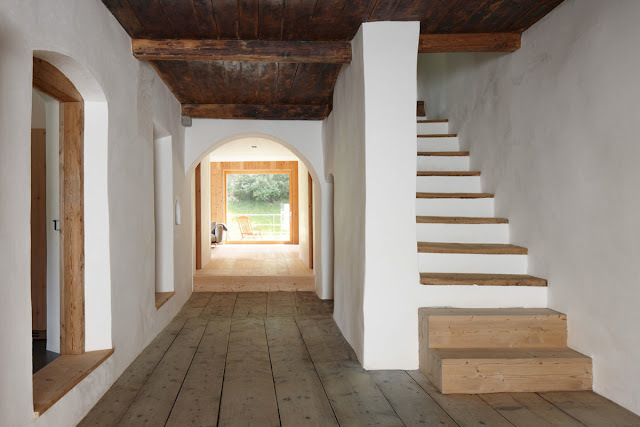 By first removing the floor of the back barn section of the house, a three-level, structurally independent wood structure, was then inserted within the existing stone frame, distinguishing itself on the exterior facade as a large wooden volume. The design allows the historical large volume of the barn to remain legible despite the changes. 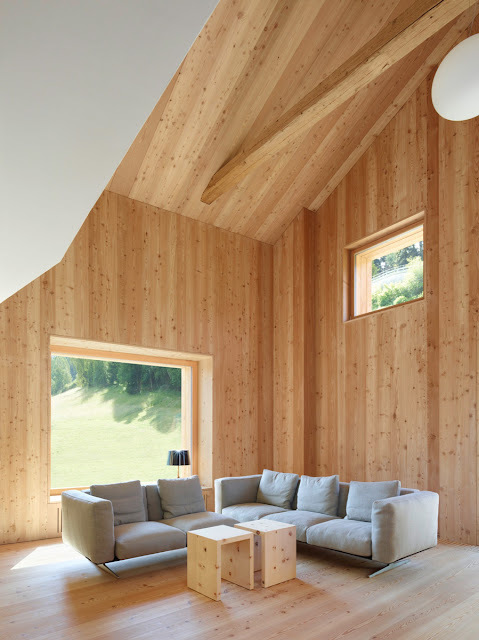 The two-story living room extends up to the roof of the inserted structure, whose inner surfaces are clad with larch wood. 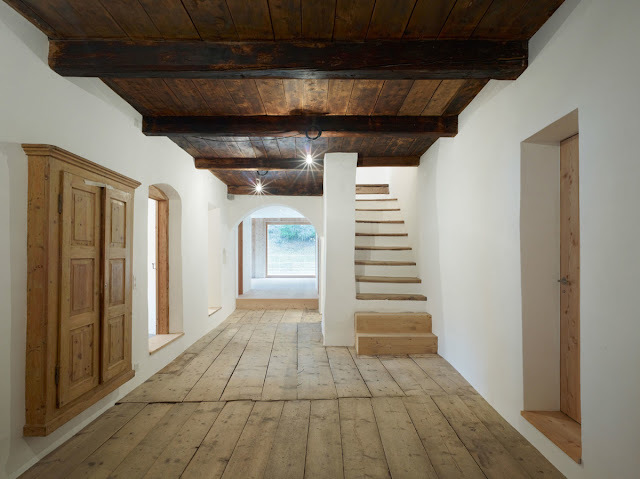 Four additional rooms that were also built within the old barn constitute a two-level sculptural transition to the former living quarters. 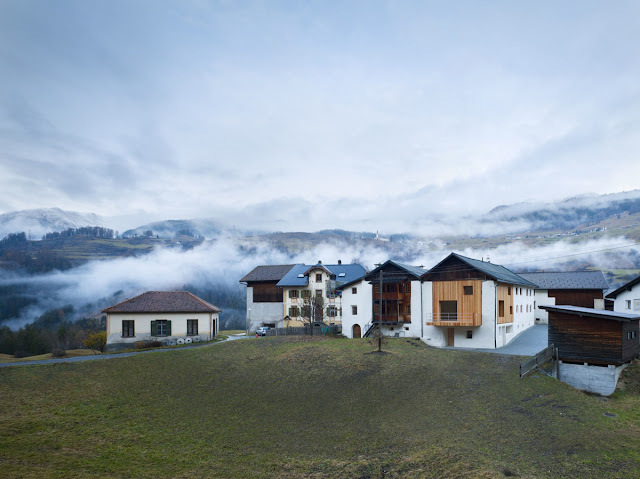 Views are open through the entire house along its longitudinal axis, and a large sliding glass door to the balcony extends the view to the mountains of the Engadine. 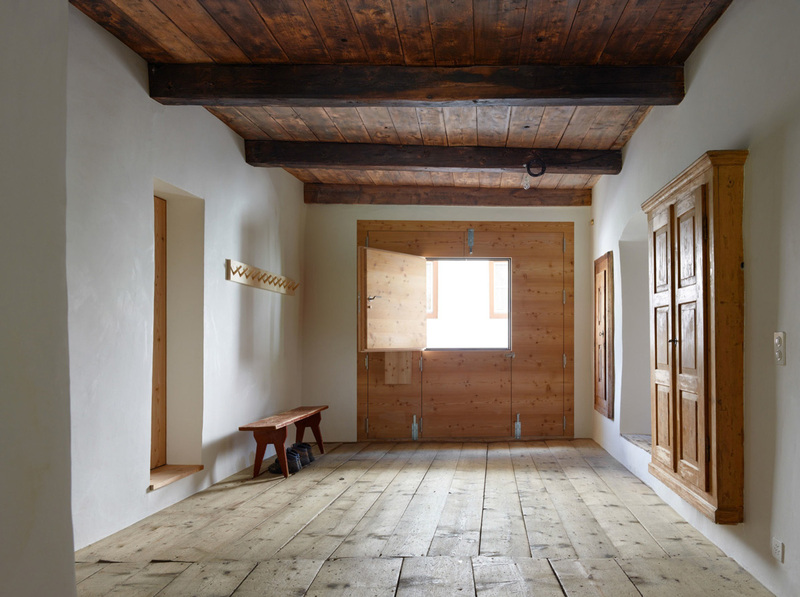 The typical local motif of deep window reveals in thick exterior walls has been adopted and exaggerated, signifying the alterations inside. 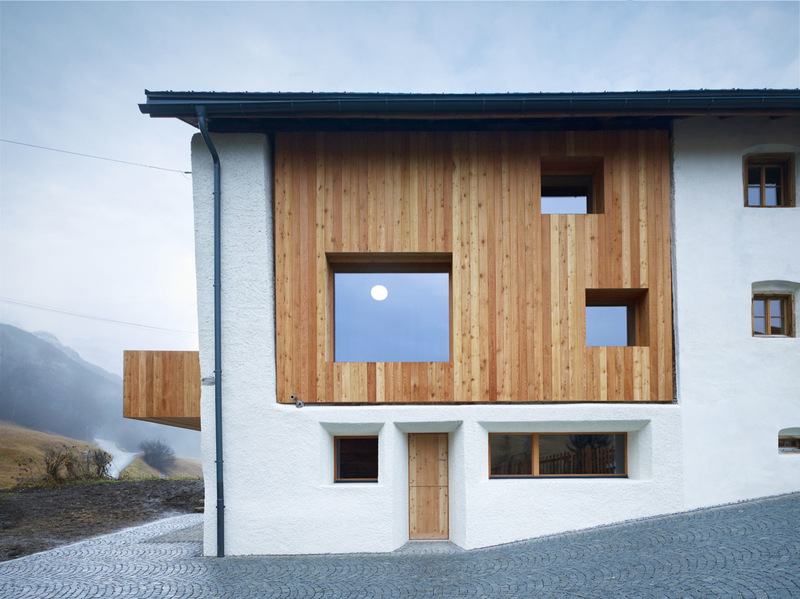 With their sharp-edged detailing, these few large window openings stand out in contrast to the existing architecture. 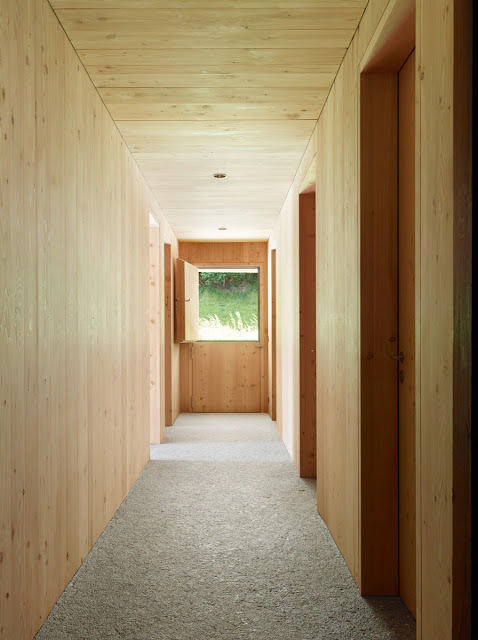 Referencing historical barns in the vicinity, rough-sawn, untreated larch boards were chosen for the facade. 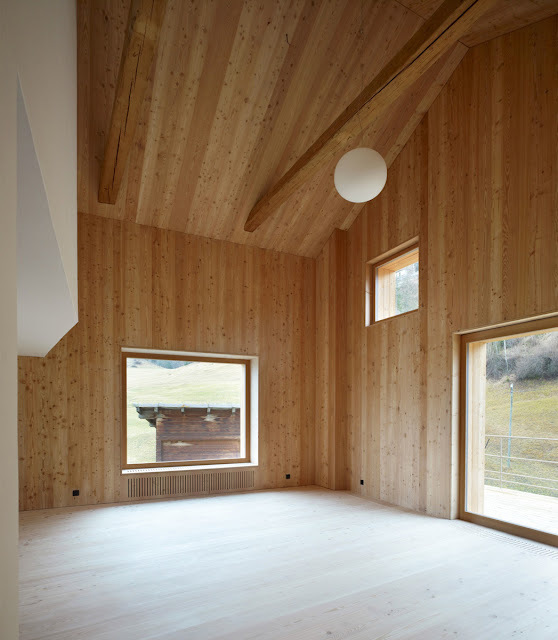 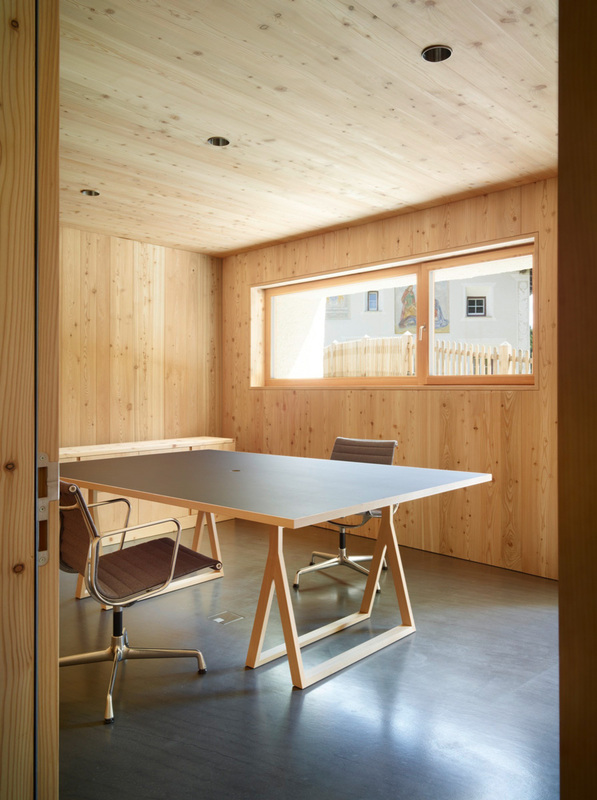 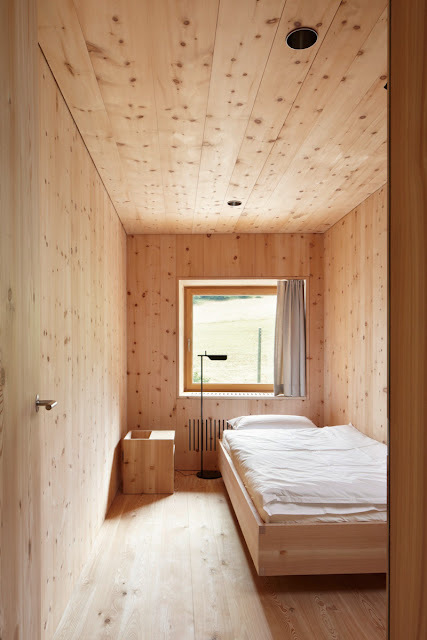 The ongoing aging process of the wood helps the project to fit within the built fabric of its surroundings."